Making weather tracking a fun activity isn't hard-it just takes a little know-how. (cc image courtesy of Kathleen Zarubin via Flickr). In the documentary In the Shadow of the Moon astronaut Charlie Duke recalls of his time on the moon: “I was able to look out the window to see this incredible sight … oceans were crystal blue, the land was brown, and the clouds and the snow were pure white. And that jewel of Earth was just hung up in the blackness of space.” Fellow astronaut Alan Bean later adds, “Since [being on the moon] I have never once complained about the weather.” From the cold, airless surface of the moon these two men looked back on our windy, rainy, cloudy, weather-filled world and were amazed and thankful. The weather is a glorious thing, an arena where God’s goodness, wisdom, and love are on display. As the Psalmist wrote: “The heavens declare the glory of God … Day after day they pour forth speech.” But when was the last time you looked up at the sky in wonder? Thanked God for the rain? Or merely watched the beauty of the clouds as they passed overhead? The truth is we can’t always move ourselves to wonder—especially with something as mundane as the weather. However, sometimes a little basic knowledge can go a long way to moving our hearts to worship. You don’t need a meteorology degree to see God’s hand in the weather, just a little basic knowledge. To that end, here is a layperson’s guide to backyard meteorology along with some ideas about how your family can get outside and experience God together under the daytime sky. Weather maps also have H’s and L’s for high pressure (in the middle of the air mass) and low pressure (at the fronts), respectively. Precipitation and changes in the weather happen along the fronts. There are several kinds of fronts, but the two most important are the warm fronts and cold fronts. Warm fronts happen when a warmer air mass pushes out a colder one. They move more slowly than cold fronts, produce less precipitation, and, of course, create warmer temperatures. Stratus and cumulus clouds can often be found in warm fronts. Cold fronts happen when a colder air mass displaces a warmer one. They move faster than warm fronts and produce more dramatic weather. Cumulonimbus, or thunderstorm clouds, can be found in storm-producing cold fronts. Cirrus clouds are some of the highest clouds. They look thin and wispy and are sometimes called “mare’s tails” because they can resemble the tail of a horse. 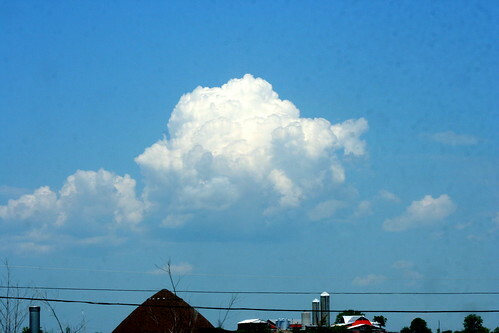 Cumulous clouds often mean good weather. (cc image courtesy of Bobolink via Flickr). Cumulous clouds can look like fluffy cotton balls floating like islands in the sky. They often appear in the middle of a high pressure system and can be a sign of good weather. Stratus clouds are a uniform layer of cloud resembling fog but not touching the ground. Stratus clouds often make a slow, continuous rain. These are the towering storm clouds that can bring severe weather and even form hail. Cumulonimbus clouds are often called “anvil clouds” because of the way the wind can flatten them out like the top of an anvil at their highest altitudes. 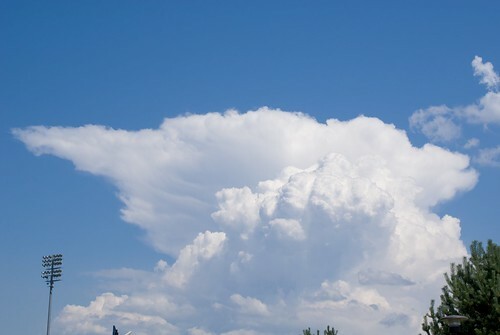 Cumulonimbus clouds are storm clouds and can look like anvils on the top. (cc image courtesy of spyffe via Flickr). Cloud Scavenger Hunt: Ask each member of your family to keep a weather journal. Keep track of the types of clouds you see. At the end of the week get together and see who found the most varieties. Make Weather Predictions: Instead of checking the forecast every morning, make your own weather maps. Search online for blank weather maps and print a few. Then copy down the day’s weather map from the TV or Internet and use it to make guesses about the temperature and precipitation. Make it a competition with your family and see who is the best predictor! Track the Weather Together: Keeping a detailed journal of the weather is a great way to learn about it as a family and also to spend time outside. Make a chart with categories like temperature, cloud type, barometric pressure, and humidity and put it on a wall in the kitchen. Each day make observations about the weather and write them down on the chart. You can even assign each family member his or her own category to track. Soon you will start to notice patterns and be on your way to becoming backyard meteorologists!